Digital marketing is an umbrella term for all of your online marketing efforts. 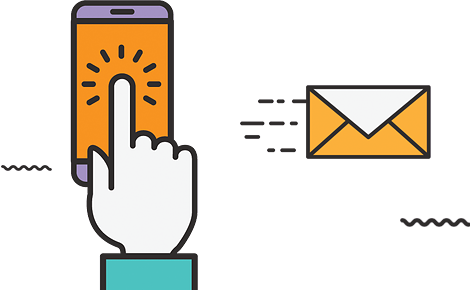 Businesses leverage digital channels such as Google search, social media, email, and their websites to connect with their current and prospective customers. The reality is, people spend twice as much time online as they used to 12 years ago. And while we say it a lot, the way people shop and buy really has changed, meaning offline marketing isn’t as effective as it used to be. Marketing has always been about connecting with your audience in the right place and at the right time. Today, that means that you need to meet them where they are already spending time: on the internet. From your website itself to your online branding assets -- digital advertising, email marketing, online brochures, and beyond -- there’s a huge spectrum of tactics and assets that fall under the umbrella of digital marketing. And the best digital marketers have a clear picture of how each asset or tactic supports their overarching goals. Unlike most offline marketing efforts, digital marketing allows marketers to see accurate results in real time. If you’ve ever put an advert in a newspaper, you’ll know how difficult it is to estimate how many people actually flipped to that page and paid attention to your ad. There’s no surefire way to know if that ad was responsible for any sales at all. On the other hand, with digital marketing, you can measure the ROI of pretty much any aspect of your marketing efforts. What is ROI(Return on Investment)? Return on Investment (ROI) is a performance measure, used to evaluate the efficiency of an investment or compare the efficiency of a number of different investments. ROI measures the amount of return on an investment, relative to the investment’s cost. To calculate ROI, the benefit (or return) of an investment is divided by the cost of the investment. The result is expressed as a percentage or a ratio. All our projects are completely bespoke, so it is difficult to give exact figures. At the moment we work with companies who have budgets ranging from a few thousand rupees per month. Rather than having a minimum amount, we adjust our strategies, volume of work and timescales based on the available budget. We can also adjust the approach we take depending on how much involvement our clients have. Furthermore, if you have a service we may have the use for, we are happy to trade skills if possible. At Adox Global Pvt Ltd, we like to keep our clients up-to-date. We send monthly reports outlining performance, as well as work completed and upcoming work. In addition, we will also show you how to use Analytics and set up appropriate dashboards so you can keep track of performance yourselves. We also provide action lists detailing all the areas we believe need working on, with appropriate due dates. If that isn’t enough, we also will be in regular contact and if possible will spend time in your office working alongside you. SEO stands for search engine optimization, and while there are many detailed explanations, the best one we can think of is “making things appear higher in Google (or any other search engine)”. In our case, we also break SEO into on-site and off-site SEO. On-site SEO works on things on your own site that will help search engines understand what you do and find all the pages on your site. Off-site SEO is concerned with creating links back to your site in order to help demonstrate relevance and popularity to Google. It is obviously more technical than that, but we reckon these are good summaries. In the majority of countries in the world, Google has the highest search engine market share. This is especially true in India, where its market share is regularly over 90% of all search traffic to sites. As a result, we tend to spend most of our time working on optimizing sites for Google. Luckily though, a lot of the tactics we use will have a similar effect in the other search engines. If we work in countries in which other search engines are dominant, we will tailor our approach to make sure you get the best possible results. PPC stands for pay-per-click and is a phrase used to describe the paid advertising model available to companies on sites such as Google (the results at the right or top of the normal search results). The name comes from the fact you only pay for the advertising when someone clicks on it. It is commonly used to refer to Google AdWords, but could equally describe Bing Advertising, Facebook Advertising or any other kind of online advertising where you pay per click. Contrary to popular belief, ranking first in Google has nothing to do with money! Put simply, you can’t pay to be first. While large marketing budgets help when it comes to SEO, as you can do more, it doesn’t guarantee results. More specialist smaller sites or sites creating great content can often outrank bigger companies. All the search engines do offer paid advertising models, where you can pay to appear higher in the paid results, but these have no impact on the natural search results. Content marketing has been around for decades, but more recently has been used in the digital marketing world to mean creating content for either on-site or off-site use in order to gain links, social shares, and traffic. Local SEO focuses on achieving results in location-based searches, for example, “Digital Marketing Company in Ernakulam”. These types of searches are becoming a lot more frequent and often result in a map being displayed in the search results. There are some very specific tactics that can be employed to affect performance in the location-based search results. Do you promote through social media? Yes! we are the best social media promotion company in Ernakulam, Kerala. We feature the payment mode as per the number of social media that we include in the package. The digital marketing package is a prepaid service which includes the services as per the monthly subscriptions.